Europe is pointing the collective finger at Polish coal, the polluting fossil fuel that continues to power the country, yet is barely profitable. Despite political pressure and the question marks surrounding its future, young Poles continue to head down the mines in droves, turning a blind eye to the pleas from Brussels. Michal takes his seat in a heated lecture theatre at the AGH University of Science and Technology, not far from the centre of Krakow. By the end of the year, he will have finished his Engineering degree and will be looking for work down the mines, following in his father's footsteps. By pursuing his studies at the School of Mining and Metalwork – one of the best in the country – the 24-year-old is helping keep the mining culture of southern Poland alive. Yet unlike his ancestors, Michal has no guarantees of still being able to find work the day he retires, or even keeping hold of a job until the day the hard labour wears his body out. This is because coal is worth a fraction of what it used to be. Polish mines are facing closure and Europe is putting pressure on Warsaw to withdraw its investment in an energy source that continues to pollute the country. As furnaces burn merrily away, the spire of Wawel castle – former abode of the Polish royal family – often gets lost in the fog. The low cloud that gathers over Krakow doesn't only result from the harsh Polish winter; coal swallows up the city streets with its light, sulphurous odour, and coats the walls with a layer of blackness. Once home to Polish kings and queens, Krakow also rules the roost when it comes to the pollution of fine particulates. Coal is in the hearts, and lungs, of Lesser Poland (the region home to Krakow. ed.). However, across the city, there are an ever-growing number of cyclists, as well as activits in white protective masks, hoping to limit the harmful effects of an air that is so contaminated and cold that it stings the lungs. In response to the estimated 3500 premature deaths caused by coal pollution in Poland each year (according to the Polish NGO Heal), local authorities in Krakow delivered a crushing blow to the sector in October 2015, banning local residents from using coal stoves. Last year, 4 of the 14 largest coalmines came close to shutting down. Hostility from trade unions saved them, despite attacks from the centre-right government at the time under orders from the European Union; a stance that undeniably cost them support during the last parliamentary elections. This marked the return to power of the Eurosceptic and pro-coal Law and Justice Party (PiS). The glimmer of recovery began to be visible in the crisis-stricken industry towards the end of 2015. It seems that nothing can stop the flood of young Poles who continue to head down the mines in the hope of securing a contract, and the 2,000-3,000 zloty (460-690 euros) per month that come with it. However, the ban on coal stoves won't be enough to make houses coal-free. Across towns, cities and the fields of the countryside, thick smoke continues to billow from chimneys. In fact in Lesser Poland, you're hard-pressed to find a family that hasn't ventured down the mines at some point. "When I left school, I didn't really know what to do." Michal explains, "My father was a miner so it was inevitable that I'd end up in the coal industry myself." He went underground to develop his career, pointing to the fact that practically every budding engineer on his course grew up in a mining family. Yet generally, family tradition counts for little when parents have their say. Michal angered his father when he took his first steps into the Janina Mine, situated in Libiaz, around 50 kilometres from Krakow. Pawel (28), has worked there for the last 2 years. The son of a miner, he hopes for an alternative future for his own baby boy. "That being said," he continues with a resigned smile, "My father also didn't want me to work down here, and yet here I am." In the town of Libiaz, there is no getting away from the mine. The pungent smell gets inside your nose and throat, as an incessant procession of cars head towards the small hill on top of which the mighty Janina sits. Even the local football club is named after it - Górniczy Klub Sportowy 'Janina'. Just a few hundred metres away, the young footballers kick the ball around a pitch paid for by the Tauron energy company. The youngsters that wish to stay in Libiaz and learn a profession have only one choice – vocational training offered by Tauron. Every year, 20 apprentices learn how to use a hammer, as well as how to keep their insides in working order once underground. The company that owns the mine feeds, heats, entertains and shelters local people, alongside providing the local council with around 3 million zlotys (700,000 euros) every year in tax revenue. Along with this fiscal injection comes Tauron's aspirational propaganda. The mayor, trade unionists and miners alike all insist that Janina and its immense coal reserves have many long years ahead of them. One phrase in particular is on the tip of everyone's tongues: "We have the opportunity to belong to a major energy company." Tauron's investment in gas compensates for the low price of coal and keeps the mine afloat. But what exactly can Tauron do in the long-term? Will the government be able to continue its investment in the company indefinitely? Everyone wants to think so, though doubts remain despite these reassurances. 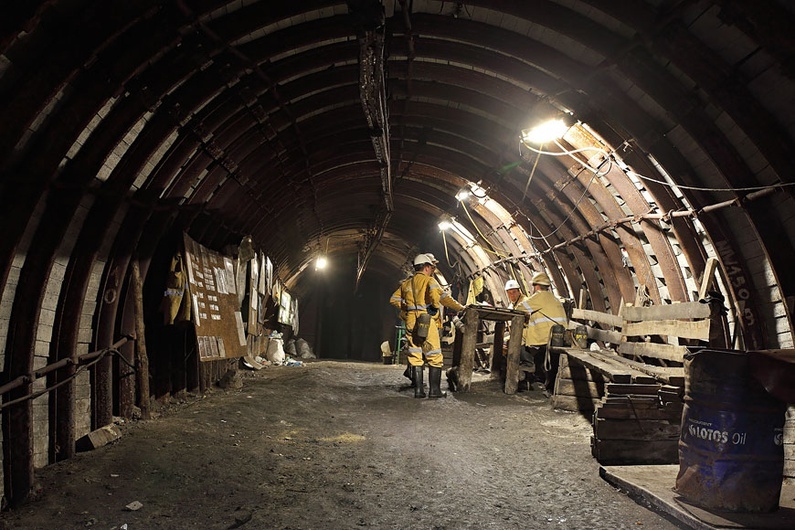 Around 30% of the workforce have been laid off in recent years in order to keep the mine profitable, and the town has started to spend money in the hope of attracting other companies. Krzysztof Kozik, a trade unionist and activist within the ruling conservative party, is sceptical about how much leeway his party has when it comes to helping the mines. "The Polish government can't invest in it because the European Union has set rules," he says bitterly. He wants to believe that PiS would not be afraid of turning their back on Brussels. As he continues his studies at university in Krakow, the young Michal is less optimistic. It's clear to him that one day he will have to go and work overseas, though in the meantime he will carry on the family tradition. Translated from Pourquoi les jeunes polonais vont-ils au charbon ?